KW Conferences was thanked for the excellent services rendered for the 10th International Conference on Rock Fragmentation by Blasting. We are deeply honoured to have received this wonderful commendation and we hope to offer our services to conferences and congresses in the future with the same dedication and commitment. 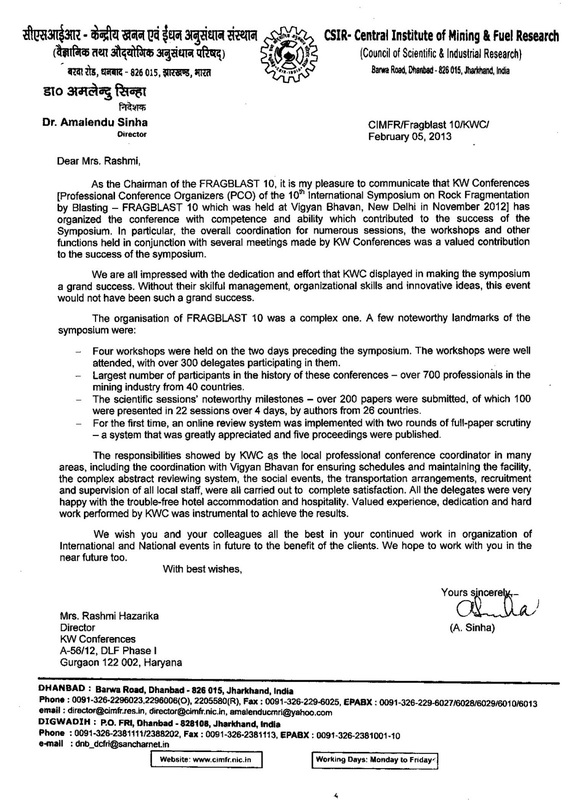 As the Chairman of FRAGBLAST 10, it is my pleasure to communicate that KW Conferences Professional Conference Organizers (PCO) of the 10th International Symposium on Rock Fragmentation by Blasting – FRAGBLAST 10 which was held at Vigyan Bhavan, New Delhi in November 2012 has organized the conference with competence and ability, which contributed to the success of the Symposium. In particular the overall coordination for the numerous sessions, the workshops and other functions held in conjunction with several meetings made by KW Conferences was a valued contribution to the success of the Symposium. We are all impressed with the dedication and effort that KWC displayed in making the symposium a grand success. Without their skilful management, organizational skills and innovative ideas, this event would not have been such a grand success. - Four workshops were held on the two days preceding the symposium. The workshops were well attended, with over 300 delegates participating in them. - Largest number of participants in the history of these conferences – over 700 professionals in the mining industry from 40 countries. - The scientific sessions’ noteworthy milestones – over 200 papers were submitted, of which 100 were presented in 22 sessions over 4 days, by authors from 26 countries. - For the first time, an online review system was implemented with two rounds of full-paper scrutiny – a system that was greatly appreciated. - Five volumes of proceedings were published – four for the workshops and one for the symposium. The responsibilities showed by KWC as the local professional conference coordinator in many areas, including the coordination with Vigyan Bhavan for ensuring schedules and maintaining the facility, the complex abstract reviewing system, the social events, the transportation arrangements, recruitment and supervision of all local staff, were all carried out to our complete satisfaction. All the delegates were very happy with the trouble-free hotel accommodation arrangements made by you. Valued experience, dedication and hard work performed by KWC, was instrumental to the achievement of the result. We wish you and your colleagues all the best in your continued work in the organization of International and National events in future to the benefit of your clients and to your company. We hope to work with you in the near future too.